Chinese Premier Li Keqiang has asserted that China will step up desert control in conjunction with international efforts. “We’re willing to strengthen cooperation with foreign countries in exploring and practicing new ideas and strategies for desert control and prevention, as well as new technologies and industries in environmental protection,” Li said. The fourth Kubuqi International Desert Forum began on Friday in the Kubuqi Desert in north China’s Inner Mongolia Autonomous Region. United Nations Convention to Combat Desertification (UNCCD) describes desertification as “land degradation in arid, semi-arid and dry sub-humid areas resulting from various factors including climatic variations and human activities”. Luc Gnacadja, Executive Secretary of the UN Convention to Combat Desertification Secretariat, warned that despite international efforts, “desertification and the deterioration of land situations have worsened year by year”. Kubuqi is China’s seventh largest desert and the ninth in the world. UN Secretary General Ban Ki-moon lauded China’s achievements in desert control on Friday. With a rising global population and the environmental costs of economic growth, issues of land deterioration and desertification will worsen in the future, said Achim Steiner, executive director of the United Nations Environment Programme, at the forum. A quarter of all earth’s surface is desert. More than 110 countries and about one billion people around the world have been affected by desertification. “The Chinese government strives to promote the construction of an ecological civilisation, and the prevention of desertification is an important part of this,” said Wan Gang, Minister of Science and Technology. Gang highlighted the role of “national labs, science and research institutions and enterprises” in innovative approaches of dealing with desertification. “In China, we have a saying that empty talk harms the nation, while practical work builds a nation. 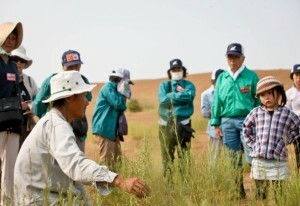 To combat desertification, what we need is more action,” said Sha Zukang, Secretary General of the UN Rio+20 Summit. The Kubuqi International Desert Forum is the only international forum dedicated to the development of the world’s desert ecological civilisation. Namibia will host the 11th United Nations Convention to Combat Desertification (UNCCD) Conference of the Parties (COP11) from 16 to 27 September 2013.